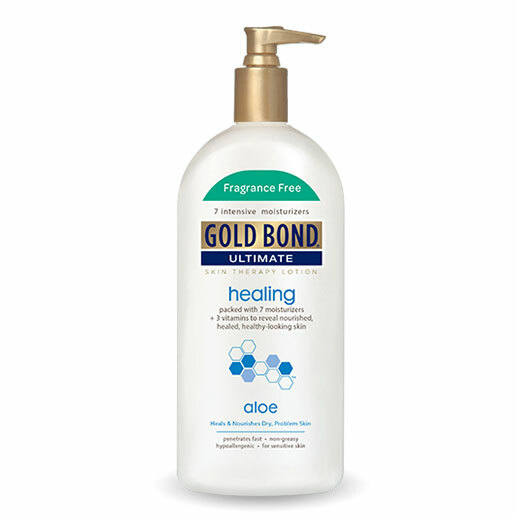 Gold Bond Ultimate Healing Skin Therapy Lotion Fragrance Free 14oz has been formulated to help you with any skin ailment you may have. Designed to support multiple kinds of skin ailments, Gold Bond skin care products can aid you with repairing, moisturizing, and calming your skin. ADW Diabetes offers a wide selection of Gold Bond skin creams, powders, and lotions in both single units and discounted bulk packs for your convenience. Gold Bond Ultimate Healing Skin Therapy Lotion Fragrance Free 14oz is specially formulated to help heal extremely dry, rough and problem skin. With seven intensive moisturizers and three essential skin-nurturing vitamins, plus the natural healing power of aloe, Gold Bond Ultimate Healing Lotion is clinically tested to moisturize for up to 24 hours. It has the power to get skin back to healthy, yet is still gentle enough to use on your face.